April 27, 30 – May 1, 2, 3 & 4, 1974. Warning Any resemblance between a member of the audience and a member of the cast is intentional and deliberately provocative. NLeR wrote: “You are invited to a wedding, a mad and ridiculous affair. The wedding cannot take place until the bridegroom has replaced an Italian Straw Hat which his horse has eaten on the very morning of the wedding. Why he has to replace the hat before he can get married none of us have yet discovered. This is your chance to act: for once you do not have to sit quiet and suffer, it is a free for all and you may speak, shout and sing as you feel disposed. There are a few wedding guests there to lead the way so come and join in. To aid your singing the ditty is printed below. The tune, lead by Montmatre, is easy. The whole of the theatre is the stage and you are on it – we wish you the very best of French luck. Full of elation, we drive in procession along the boulevard. “Tonight we introduce you into the impossible world of Nikki le Roy’s Italian Straw Hat where hats are eaten, pigs do fly and the moon is made of green cheese. Just for one night we turn the world on its head and enjoy looking at it the other way up. Congratulations to all those concerned in Night of the Iguana. This was a production which was very much admired. Our 25th season is ending in a very satisfying style with Richard Porter’s production of White Liars winning the Southwick Festival and being placed third out of nine plays in the Divisional Final at the Ashcroft Theatre, Croydon last Wednesday. This is an achievement to be proud of and we must set our sights on reaching Croydon next year as well. THE WICK Theatre Company’s programme notes on this production of An Italian Straw Hat [Barn Theatre, Wednesday] gave warning as to what the full house could expect. A message? No chance. A moral? Forget it. When one reads, ‘Misdirected by Nikki le Roy’ and ‘Just for one night we turn the world on its head and enjoy looking at it the other way up’, then the chances are you are in for a giggle. 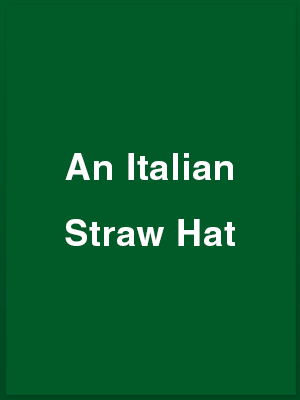 And that is exactly what An Italian Straw Hat is; a giggle. It’s frivolous, frothy French farce and the plot is there only as a vehicle for witty lines and a queue of outrageously eccentric characters to flutter through the play. The plot, such as it is, concerns the wedding day adventures of one Fardinard, played by Barrie Bowen. Fardinard is out riding on his wedding morning when his horse eats a straw hat belonging to a married lady having a ‘liaison’ with a military gent. The hat must be replaced or the jealous husband will bow steam from the top of his head. And it is up to Fadinard to find an exact replacement, which starts a mad dash across Paris and meetings with the most unlikely characters. There wasn’t a weak link in the cast. Two outstanding performances came from Cara, the young and beautiful milliner played by Monica Joyce, and the maid Virginia [Helena Drzyzga]. Nikki le Roy, Frances Moulton, Bill Mac, Stephen Hayler and Miranda Bowen were all excellent in their cameo parts, as indeed were the rest of the cast. Alan Upton’s Nonacourt sounded more like a Sussex farmer than a French market gardener, but how do you get it across in a French accent that you are a bumpkin? There are two more performances of the play, tonight [Friday] and tomorrow. Both start at 7.45 p.m. I believe it was the producer himself who likened the Wick Theatre Company’s presentation of The Italian Straw Hat to Monty Python’s Flying Circus, but whoever it was he was not far wrong. It is a delightfully zany, completely inconsequential farce. The story itself is Feydeau-like in character but this production was helped along by Nikki Le Roy’s highly skilled and inventive direction. The hard-working leading rolls of Fadinard, the bridegroom in search of an Italian straw hat [and you’ll have to see the play to find out why, it’s much too involved] is played by Barrie Bowen with great gusto. His bride-to-be is Jane Durance, and her down to earth father, Nonacourt, is Alan Upton. George Porter makes a rare stage appearance as Vezinet, the bride’s deaf uncle. Stephen Hayler is her rather dopey cousin Boby. Along the line of people whom Fadinard encounters in his search for the hat, are La Comtesse de Champigny played by Frances Moulton in wonderfully weird make-up, and her cousin Achille de Rosalba played by Nikki LeRoy in even more wonderfully weird make-up. Monica Joyce is Clara, a young and beautiful milliner, and she makes a charmingly comical cameo of the part, as does Bill Mack as her aged book-keeper Tardiveau. The cause of all the trouble, and the owner of the hat, is Mme Beaujolais played by Miranda Bowen with Neil Shephard as Captain of Zouaves and there is also Emile Tavernier rather indiscreetly in attendance on her. Others taking part in the romp are Dinkie Flowers, Helen Drzyzga, David Wiltshire, Mary Payne, Suzanne Brocken, Brian Moulton, Sally Browne, Sheila Deasey, Susan Blandford, Laura Martin, Iris Bamborough, Elizabeth Righton, Elsie Hilton, Roy Bull and Andrew Theaker. Clive Bull helps the party along as Montmarte, the accordionist. The final performance is tonight, so try to get along. You’ll love it provided your sense of the ridiculous is in good shape.